I was introduced to Ethiopian food by a colleague then and now a dear friend about 8-9 years ago. She slaved in the kitchen for my roommate and me and made delicious vegetarian food and served coffee the true 'Ethiopian' style. Of course she being Ethiopian made our experience as authentic as possible. Since that memorable sunny afternoon in LA, I have generally tried Ethiopian food every city I visit in the US. It has become one of those once a quarter cravings, got to go for Ethiopian. In the last few years, Ethiopia has become a more personal country for me with family connections, stories and fond memories. So Ethiopia means more to me than the Injera and the Coffee. With that as a start, this theme was super special for me. It's one cuisine I love to eat and was so happy to attempt it. Dessert: Red velvet cake, nothing Ethiopian about it, but a friends birthday celebrations were so worth it! Drinks: Fresh Ethiopian coffee, freshly roasted and ground and brewed. Yup, that's how we roll. 1. Soak the lentils overnight. 7. Taste and adjust seasoning. 9. 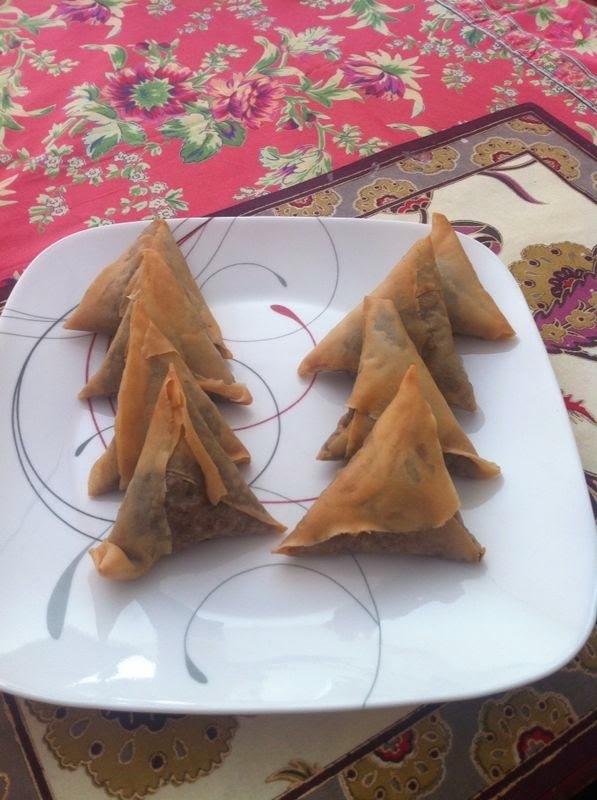 And now the joys: There is no way I can do justice to explain how to make sambusa: So here is a You tube video of how to 'prepare samosa' and use this as a guideline for wrapping and frying. Just FYI- To fry both types of Sambusa's (Total 30), I took about an hour, so start some music and go for it! Though we didn’t have complete attendance, it was a really fun gathering and a very interesting style of cooking. Just a couple of spices and an abundance of aroma's and flavors. I will definitely try my hand at a few more Ethiopian Dishes. Thanks for this recipe! Just got back from Ethiopia, where in Harar we enjoyed lentil sambusas. Mother of two girls... and?